She’s been banished from her home without a word of explanation. Assassins are hot on her tail, and she’s fleeing without a plan. On the whole, her future looks pretty grim. Then again, it’s nearly impossible to catch a dark elf. And even tougher to kill one. Fortunately, I am still able to post some very exciting details about a contest that is being run throughout this tour! 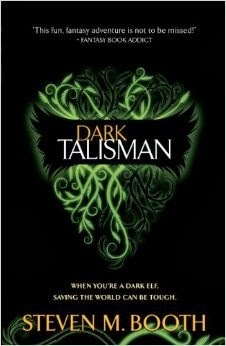 One lucky individual will win both a Kindle Fire HD and an E-book copy of the Dark Talisman. Follow the instructions as provided on the widget below to enter this very exciting contest!!!! Unfortunately, I tried futilely to embed the rafflecopter HTML text into this post. Alas, it just keeps coming up as an unexciting hyperlink.